This year, it coincides with the first week that the givebigkern.org online fundraising and volunteer recruitment platform is open. The website went live Sunday and will remain open to receive donations and volunteer pledges through May 8, one day after the big giving day. Give Big Kern was started in 2016 by Kern Community Foundation as a nonprofit strengthening initiative that engages the entire community in giving back to Kern’s hard-working nonprofits. That means through volunteering, too! According to IndependentSector.org, a national organization that brings together nonprofits, foundations and corporations to advance the common good, the value of a volunteer hour in California in 2018 was $29.95 — just a nickel short of 30 bucks. That’s how much your volunteer time is worth to a nonprofit in Kern County that needs your support — because there are other ways to help besides making monetary donations. And sometimes, special services delivered by skilled, qualified volunteers (such as accounting, legal advice, graphic design or translation/interpreting) are worth much more than nonprofits can afford. Your time and talents are valuable and can be an important asset to a nonprofit, especially one that is all-volunteer run or relies on a pool of volunteers to provide services. Also, on many grant applications that require a “match,” nonprofits can list the cumulative value of annual volunteer hours from their entire volunteer pool. That can amount to thousands or even tens of thousands of dollars and make their ask stronger. Want to give back by volunteering? Start by asking what’s your passion: people in general, children and youth, seniors, animals, nature, advocacy or preventing disease, hunger, poverty, homelessness or domestic violence? Go to givebigkern.org and check out the profiles of close to 130 participating charities. Is there one that calls out to you? If so, choose “Volunteering” from the drop-down menu at the top of the page and pledge volunteer hours to the nonprofit of your choice by filling out the online volunteer form. It’s that simple. 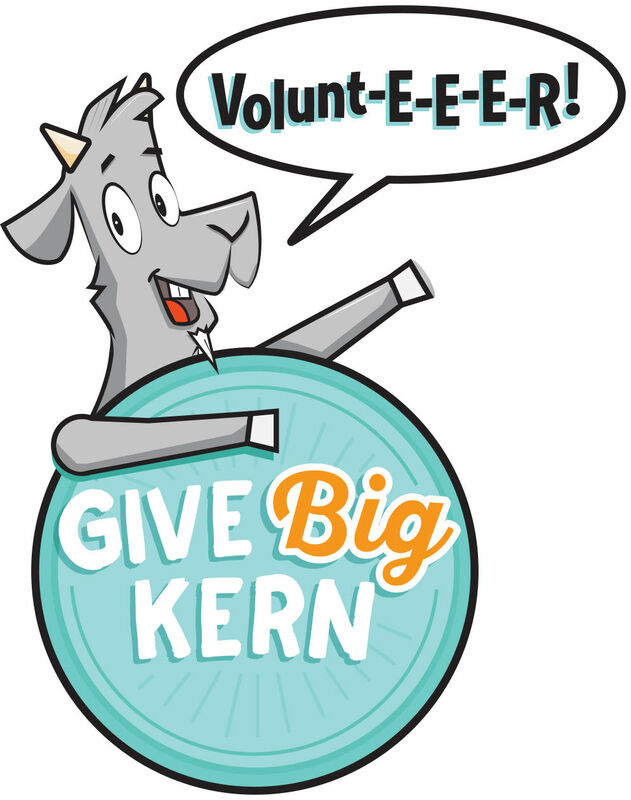 After Give Big Kern Day, you will be contacted by that agency to discuss volunteering opportunities. If you aren’t sure which agency you would like to volunteer with, no problem: the Volunteer Center of Kern County supports all the nonprofits with their volunteer needs and provides a variety of assignments for those wanting to give back to the community. The way Give Big Kern participating nonprofits celebrate Volunteer Week varies. Some are using the opportunity to recruit volunteers, others to acknowledge and thank their volunteers. An Annual Membership Drive (volunteer recruitment event) from 9 a.m. to noon at The Guild House of Bakersfield, located 1905 18th St. Coffee, treats and information about joining the Guild House family of volunteers, which is more than 200 strong, will be provided. Guild House volunteers staff lunch Monday through Friday and special events at the Guild House restaurant, with all proceeds benefiting the Henrietta Weill Memorial Child Guidance Clinic. For more information, call Guild House Membership Chair Renee Kinzel at 661-378-0990. A volunteer appreciation event from noon to 3 p.m. at The Center for Sexuality & Gender Diversity, located 902 18th St. Center board members and staff will be barbecuing and serving lunch to their volunteers. “The Center could not deliver all our services and support to the LGBTQ community without our wonderful team of Volunteers. They are treasured and at the heart of our efforts,” Board Member Cindy Smith wrote in an email. For volunteering opportunities with the center, write to info@thecenterbak.org. Thanks to the generous support of our Give Big Kern sponsors, Kern Community Foundation will award a $1,000 prize to the nonprofit that secures volunteer pledges from the largest number of individual volunteers through givebigkern.org, and $500 to the nonprofit that receives the largest number of pledged volunteer hours, by midnight May 7. For more information, visit givebigkern.org. Louis Medina is the director of Community Impact for Kern Community Foundation. He may be reached at Louis@kernfoundation.org.